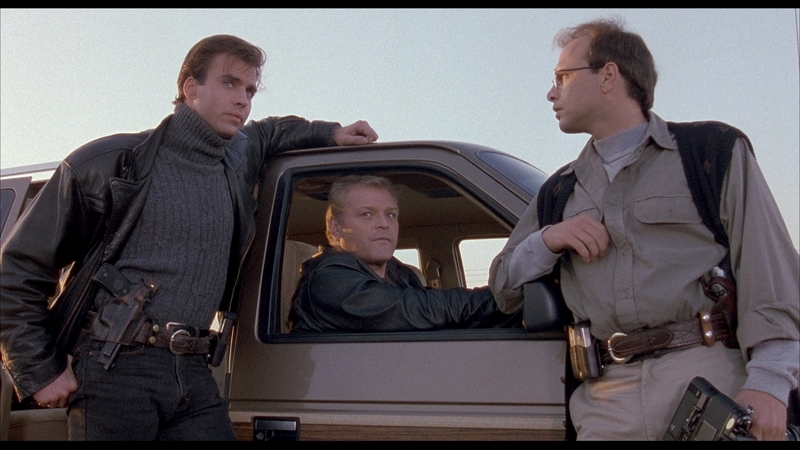 I've always felt that Brian Dennehy was a tremendously underrated actor, so when I saw that Kino Lorber was releasing a movie of his that I've never seen before - 1990's The Last of the Finest - I jumped at the opportunity to take a look. Dennehy has played the villain, the hero, and everything in between over his long career, and here he's giving one of his more noble performances: a police officer putting his life on the line to fight corruption by both local politicians and those within the department he works for. 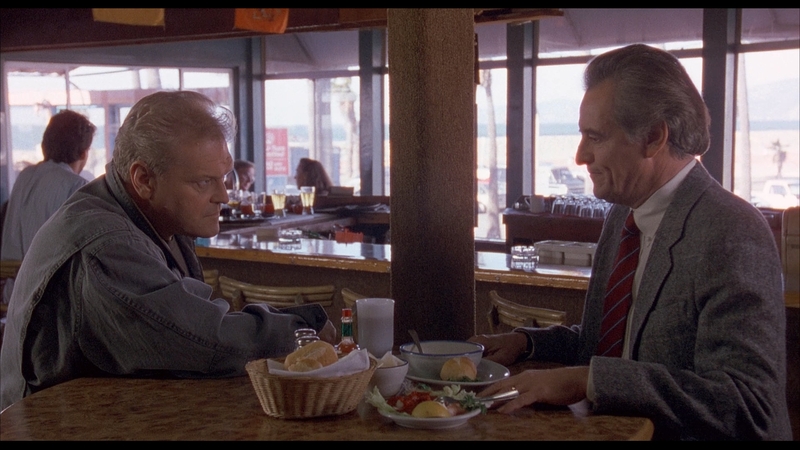 Dennehy stars as Frank Daly, a married cop with a pair of kids who works for the LAPD. 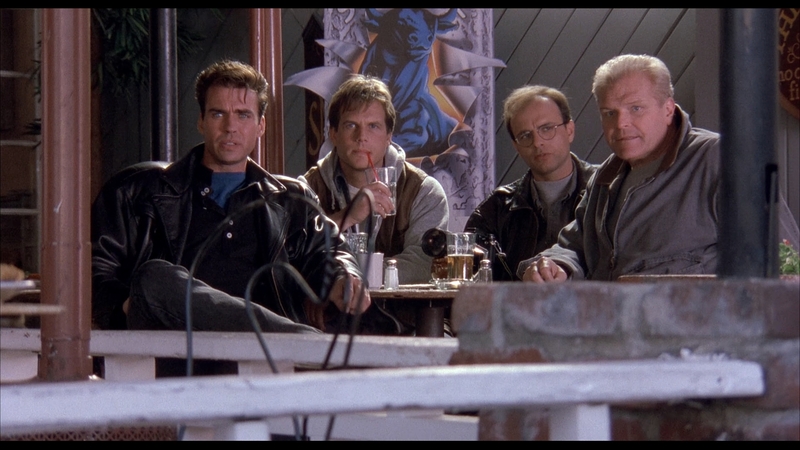 His partners on the force are also played by some very recognizable actors (although they were less recognizable at the time of this movie's release): Bill Paxton (as Howard "HoJo" Jones), Joe Pantoliano (as Wayne Gross), and Jeff Fahey (as Ricky Rodriguez). The four men go to make a crime bust at a downtown meat-packing plant, but when Daly calls in for back up, his boss on the force, Captain Torres (Henry Darrow), orders him to wait for the DEA to arrive. Daly doesn't, and a big shootout ensues, with the drug dealers burning all the money they have stored in the plant (as well as most of the plant itself) and then escaping. Daly and his team are suspended, but that doesn't stop the foursome from continuing to investigate. However, things go awry when a member of the team (I won't tell you which one, but it's given away in the movie's trailer - also part of this release, lest you be tempted to watch it first) gets killed by one of the bad guys. Daly is now the target of a major investigation about violating his suspension, but he decides to resign instead. Not long afterwards, his two surviving partners also decide to leave the LAPD. You don't get any bonus points for guessing that these three former officers continue their investigation - now wanting justice for their fallen colleague and friend. Although The Last of the Finest was released in 1990, it still feels very much like an 80's action film, but sadly that's to the movie's detriment. The scenes that work best in the film are when it deals with the drama involved between the characters. When it switches to elaborate (or not-so-elaborate, even by 1990 standards) action pieces, the movie feels like a rehash of a rehash. There's a lot of shooting, fisticuffs, and broken glass, but nothing really creative or original. This is a title where less definitely would have been a whole lot more. So despite the great cast assembled, The Last of the Finest turns out to be pretty dismissible. It's worth a look if you're a fan of one or more of the actors involved, but it's unlikely to be something you want to re-visit down the road. The Last of the Finest shoots its way onto Blu-ray in a standard Elite keepcase from Kino Lorber. The single-layer 25GB disc is packaged with a 22-page full color booklet that simply features box covers (four to a page) of other "Studio Classics" releases from Kino Lorber. There are no front-loaded trailers on the Blu-ray, whose main menu features a still shot (taken from the movie) of the four main characters, with menus selections at the bottom center of the screen. The Blu-ray is Region A locked. The Last of the Finest was shot on 35mm film and is presented on Blu-ray in its original theatrical aspect ratio of 1.85:1. Like a lot of transfers from Kino Lorber, this one is pretty middling. There's a healthy amount of grain visible in most shots, which - depending on the lighting of the scene in question - can at times be quite obtrusive. Detail is decent, but sometimes it appears as if a little too much DNR has been applied to faces - which often look smoothed over when they should show more lines and wrinkles. Dirt and defects on the print are kept to a minimum, but viewers will notice a fleck here and there throughout the presentation. With all of the above in mind, frequent buyers/viewers of Kino titles should know what to expect here, particularly if you have other catalog releases of titles that were originally released by Orion. The transfer doesn't contain a whole lot of 1080p "oomph", but it's still the best this movie has looked on home video and any major glitches are non-existent. The only audio track (other than the commentary track) on this release is an English 2.0 DTS-HD Master Audio track, and it sounds pretty good, given its stereo limitations. Dialogue is crisp and understandable throughout, and there's some noticeable separation during some action sequences, particularly where gunshots are involved. The biggest issue for me was the mix, as both the soundtrack and the ambient noises (which sometimes come off as a bit "tinny") are often louder than the spoken word. So viewers may be cranking up their volume a few notches for the quieter moments, only to crank it back down again for the action bits. I detected no other major problems or glitches with the audio, so it's a pleasant enough listen - nothing more, but nothing less. Audio Commentary - The Producer-Director of King Cohen, Steve Mitchell, and frequent Kino Lorber audio commentator (and film historian from Mondo Digital) Nathanial Thompson team up for an informative commentary about the movie. The audio here has a slight echo quality to it and it seems like Mitchell is on speaker phone, but it's not so bad that the commentary is unlistenable - just a mild annoyance. Thompson provides most of the background info on the movie, while Mitchell provides his input both as a fan and as a director/producer of movies himself. This is a fun listen - in many ways, perhaps more entertaining than the movie itself. Trailers - A collection of five trailers, including the one for this title, all available from Kino Lorber and all of which must be watched individually (there is no "Play All" option). They consist of: The Last of the Finest (HD 2:08), F/X (full-frame HD 2:35), F/X 2 (HD 1:51), Freeway (HD 1:36), and No Man's Land (HD 1:43). Even a cast of talented character actors can't save The Last of the Finest from rising above anything beyond standard crime-drama fare. The movie can't seem to decide whether it wants to be a straight drama or an action flick, and the story suffers as a result. Worth a look if you like this cast, but it's unlikely you'll want to add this one to your home library. Rent It..